MICHIGAN STATE SPARTAN STADIUM MSU Front photo art picture photograph print - MSU Stadium Michigan State Spartan football Stadium East Lansing, Michigan art picture photo print: This MSU Michigan State Spartan Stadium exterior picture photo is made from an original black and white photograph that has been hand colored. This MSU photograph is visually a strong wide-angle architectural shot of the front of this historic Michigan State University Spartans football stadium. In this Michigan State Spartan Stadium picture photo is seen the MSU Spartan logo, the 2005 MSU Spartan football schedule, and artwork celebrating MSU Michigan State Spartan football. This Michigan State University photograph documents the front entrance to MSU Spartan Stadium, which was built in 1923, and in 1957 was enlarged to its current size. Lots of great MSU Spartan football has been played here ever since. 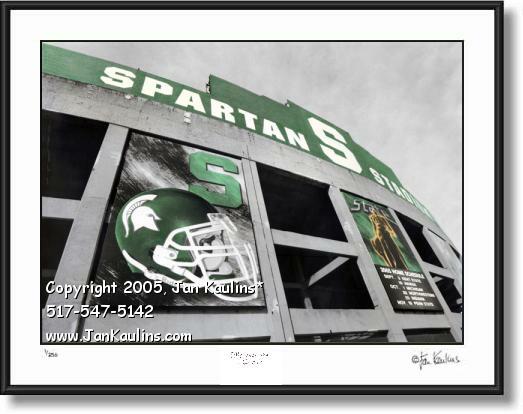 This MSU Spartan Stadium picture photo would be a great gift for a member of the MSU Michigan State University Alumni Association or any other MSU Spartan fan! TO SEE THE OTHER MICHIGAN STATE UNIVERSITY STADIUM PHOTOS AND MSU CAMPUS PHOTOS ON THIS WEBSITE, PLEASE CLICK ON THE 'BACK TO SPARTAN PHOTO...' LINK ABOVE THIS PHOTO NEAR THE TOP OF THIS PAGE.